Wine of Spain. International Wine Challenge - Gold Medal 1992-1998-2000. 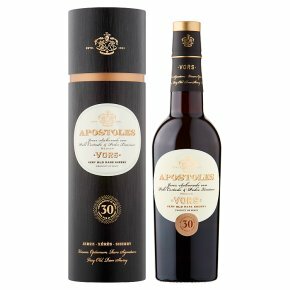 A blend of the best soleras of Palo Cortado and Pedro Ximenez of over 30 years old in perfect harmony. Complex, slightly sweet and long lasting on the palate. Perfect with pates and blue cheeses. Dark amber in hue, with a sublime bouquet marrying the delights of its two grape varieties - nutty dryness from the Palomino and sun-roasted sweetness from the Pedro Ximénez. A truly spectacular intensity conferred by 30 years of maturing in oak. Try it with patés, charcuterie and goats' cheese. Serve at room temperature.